January has been a month full of new beginnings and subtle changes. 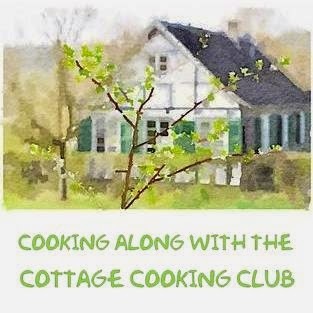 It is also the ninth month of the Cottage Cooking Club that is hosted by the talented Andrea of The Kitchen Lioness. She is our fearless leader and has kept our little group going from month to month. I certainly appreciate all that she has done. We are cooking along with Hugh Fearnley-Whittingstall's cookbook "River cottage Veg", I prepared 3 of the 10 selected recipes and was once again very pleased with the results. The first recipe I prepared was the roasted potatoes and eggplants. It’s a very simple dish, basically potatoes and eggplants cut into 1 inch cubes. This dish is easy to prepare and was by far my favorite. The smell of the eggplant roasting was truly wonderful and the taste was amazing. The next day I added the left overs to a frittata as suggested by Mr. Fearnley-Whittingstall, and that too was delicious. The artichoke and white bean dip was next. This too was easy to prepare, a quick stint in a skillet and then some time in the food processor and that was it. Most of the ingredients were from the pantry. Lemon juice was added at the end to brighten it up. This dip is all about sharing and was fantastic served with flatbread bread.The end result was creamy and savory and had even more flavor the next day. The third and final recipe was as simple as can be; Big Baked Mushrooms. Basically portobello mushrooms baked with butter, garlic, salt and pepper. Once again proving that simple ingredients and preparation can be the best. Recipes adapted from "River Cottage Veg" by Hugh Fearnley-Whittingstall, first recipe cookbook chapter Roast, grill and broil, Roasted potatoes and eggplants, page 351. Second recipe cookbook chapter Meze and Tapas, Artichoke and white bean dip page 303. Third recipe cookbook chapter Side dishes, page 385. To see what recipes the other members chose for this month, head over to the LYL post for January on the CCC website, by clicking here. Thank you, the leftovers were great on penne pasta the next day. I love roasted veggies, but that dip sounds particularly delicious! Thanks Angie, the dip was delicious! Such a simple and fun assortment this month! I especially love the dip! Thanks Joanne, it really was a great month of recipes. 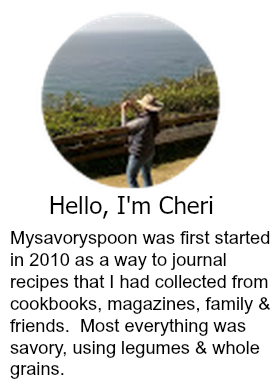 Hi Cheri, a nice collection of recipes for the month, and happy to see your assessment on each. The dip looks quite good and I plan to prepare that this month. The eggplant and potatoes looks different but perhaps I'll give it a go seeing how much you enjoyed it. See you soon. Thanks Peggy, I really enjoyed this months recipes, my favorite collection so far. All of your dishes look wonderful! I made them as well and agree with your reviews of them. I think I was most surprised by the potato-eggplant dish, simple but delicious. I love the idea of using it in a frittata. Hi Zosia, the potato eggplant dish was my favorite but then again I loved the dip. Having a great time with our group. These 3 look wonderful, Cheri. I particularly want to try the potatoes with eggplant. So simple but I have a feeling it will be amazing. Why haven't I done that before! Hi Monica, you know I thought the exact same thing, eggplant and potatoes are fantastic together. All of the recipes sound wonderful! What a fun group and a nice way to expand ideas for cooking. Thanks Susan, I do enjoy our group very much, such a nice way to meet others on-line and feel connected. Sometimes the simplest dishes taste THE BEST! I love the sound of those roasted eggplant and veggies! Thanks Shashi, hands down my favorite. Hi Nee, I'm a big mushroom lover myself, happy week-end to you! These look great. I agree, simple is best. And the thought of the eggplant roasting in the oven is heaven....even your frittata sounds perfect. Thanks Dena, you are always so kind, nothing like roasted eggplant. I agree nice group that encourages you to try new recipes from the same book. Which herbs did you add Cheri? Hi Monique, I used parsley, lemon zest and smoked paprika. Thanks! I've made the white bean and artichoke dip before and loved it! It's so fun to follow along with this cooking club using this book. Hi Lisa, this months selections were all delicious, especially the white bean and artichoke dip. Thanks! The artichoke and white bean dip is calling my name, looks amazing! Thanks Mike, I'm a hugh bean fan adding the artichokes makes it even better. Congrats on making so many recipes and also for being part of a recipe club! So motivating!! I love artichokes! So, my favorite will be artichoke and beans dip! Thanks Savita, the dip was delicious! All are delicious but that potato and eggplant roast has me drooling, adding leftovers to frittata is a great idea. Thanks Suzanne, the frittata was delicious! Thanks Amy, it was a feast! I love everyone of these recipes. Bean dip has been on my list for years - I love the simplicity of the mushrooms - and potatoes and eggplant - also brilliant in the flavor combination and ease of preparation. Simple dishes help each ingredient to shine on it's own. Love these! Thanks for sharing and hope you have a great weekend - guess I would stay away from hotels and highways before and after game time! Hi Tricia, I know things are crazy around here, the Phoenix Open is going on, the Superbowl and the chocolate festival. The roads are a huge mess. They all sound great, those mushrooms look especially good! Thanks Caroline, we had quite a feast. love the idea of artichoke and white bean dip. Problem being though, I will finish it all in one sitting - on my own! Thanks Mandy, I ate quite a bit myself that's for sure. Wow, you are one busy cook, Cheri! I wish I was as organized as you are. Mushrooms are my fav so that will be the first dish I make. Thanks for some great suggestions. Enjoy your weekend! How nice of you to take the time to cook along with us again this month - love all your dishes. I agree with you on the dip, I so loved that one and the baked mushrooms as well - have not gotten around to making the potatoes with the eggplant but plan on getting to them during our March make-up month! Lovingly prepared veg dishes - what more could one ask for?! Thanks Andrea, my mom does not seem to be getting better, but we are giving it all of our best and try and start out each day one foot in front of the other, thank you for your kindness, It is so nice to have an outlet. Great collection of recipes this month. I love the sound of those roasted eggplant and potatoes. You're right that roasted eggplant smells so so good - I roasted some for a dip just a few days ago and was reminded of this. I love when there are leftovers for another dish, too - great reminder that a frittata can put them to good use! Thanks Helen, loved all the flavors of your dip too, it's funny great minds think alike. All the recipes sound good. I'm sure the dip would be very popular for those having Super Bowl parties. Great idea Karen, this would be a hit! Thanks Kim all pretty simple but delicious dishes. Hi Charlie, did not have high hopes for the eggplant, but it turned out to be my most favorite. I didn't make any of these dishes, but I wish I had after seeing your photos! The potato and eggplant sound like perfect components for a wonderful frittata. Thanks Teresa, this month was my favorite so far. These all sound good, but the inquisitive littler boy in my wants to know if we shouldn't try a thin layer of the artichoke beam mixture in the bottom of the portabellos, then topped with the roasted eggplant mixture and possible some cheese? Thanks for sharing your thoughts on these, Cheri! Hi David, oh that sounds delicious, love the way you think!!! All three recipes sound good but I think I would especially like the potato and eggplant as well. What a great idea to use the leftovers in a frittata! Thanks Mindy, it was delicious! The roasted potatoes and eggplants sound fantastic. I've never gone wrong with any of his recipes! Thanks Beth, they are all so simple and delicious! It all looks delicious and I want to try the eggplant dish, the the mushrom also. Thanks for the recipes! Thanks Pam, we enjoyed them all! I love seeing what everyone makes each month. I made the dip and mushrooms also and enjoyed them. I love how simple so many of these recipes are. And yet, they have so much flavor. Nice choices, Cheri! We really enjoyed the roasted potatoes and eggplants. I have to say the dip was my least favorite, though I ate it over a few days, and now I wish I had made the mushrooms; they sound so good.